Sports injuries are inevitable and may happen to anyone who exercises regularly. Injuries can be a pain in the neck, especially when they are extremely painful and prevent you from following your workout regime. Here are some of the most common injuries and how you can prevent them from occurring. These are one of the most common injuries that mostly occur in runners who exercise outdoors or on the treadmill. Any other physical activity that involves running (such as tennis or squash) or high impact activity (such as jumping) can also trigger shin splits. You will recognize the feeling caused by a burning sensation in your shins (the front part of your lower legs) when you apply pressure. Sometimes you might not feel any pain until you start running and are obliged to stop. This is merely caused by the inflammation of your shin muscles. It is triggered by pressure or high intensity impact on your muscles. It is essential to stop running if you start feeling pain, as continued exercise will only worsen your condition. It may take up to two weeks to fully recover. If you are suffering from shin splints, the best thing you can do is rest your muscles and apply ice to reduce the inflammation. This does not mean you can’t exercise altogether. Perform low-impact activity such as swimming, cycling, walking or exercising on the cross trainer and elliptical machine provided that you do not feel any pain. Another option would be to take anti-inflammatory medication, but make sure you consult with a doctor before resorting to medication. If the pain does not subside, seek the advice of a medical professional. The best way to prevent shin splints from occurring is to increase your exercise intensity gradually. Make sure you warm up for a few minutes before performing high intensity exercise. If you are a beginner, start slow and gradually increase your workouts. Avoid running or jumping on extremely hard surfaces. Try to avoid uneven areas that will cause stress to your shins. Finally, make sure you wear good sports shoes that absorb the shock of high impact activity. Old or worn-out shoes should be replaced with new ones. Lower back pain mostly affects overweight people, however, it also common with athletes and fitness enthusiasts. It happens when the lower back muscles are strained from being overstretched or when the ligaments are torn. This causes inflammation in the lower back and triggers severe pain. Lifting heavy weights or movements that involve a lot of twisting (such as oblique exercises) can cause strained muscles in the lower back. Lower back pain usually disappears altogether within three to four weeks and will allow you to return to your usual routine. If you are experiencing lower back pain, it is essential to rest and recuperate not to stress the muscles further. If the pain is extreme, taking pain killers or anti-inflammatory medication may alleviate the symptoms (consult with a doctor before taking meds). Applying heat (in a hot water bottle) or ice may also help reduce the pain. Avoid movements or lifting anything heavy that will cause more strain on your back. If after a few weeks the pain still persists, seek the advice of a doctor. Make sure you warm up properly before physical exercise. If you are training with heavy weights, gradually increase your weights on a weekly basis not to stress the lower back muscles. If you are unsure of how to do an exercise when working out, ask a personal trainer in your gym to show you exactly how to do the movement. Avoid lifting extremely heavy items that will put pressure on your back. Maintain your body at a healthy weight. Being overweight can trigger lower back pain. It also helps to have a good posture and avoid slouching when sitting down. Finally regular massages can also help relieve your lower back from stress and tension. If you suffer from weak or imbalanced muscles, you are at a high risk of pulling a muscle. A pulled muscle is a torn muscle which resulted from overstretching. Our entire body is at risk of suffering from pulled muscles; however, the most common sports injuries take place in the legs. The best cure for pulled muscles is lots of rest and applying ice on the injured areas. If the pain is severe, you might need to consult with a doctor and take anti-inflammatory medication. One way of preventing pulled muscles is to ensure you warm up properly before exercise. Gentle stretching after exercise also helps your muscles relax after a vigorous workout. It is also essential to avoid doing high intensity exercise when you are extremely fatigued. Exercising when you are weak will increase the likeliness of straining your muscles. If you have recuperated from a pulled muscle, focus on strengthening that muscle with weight training. Increasing the strength of a muscle will reduce the risk of straining it. Some common injuries take place in the shoulder. This may include sprains, strains or dislocating it altogether. Exercise involving a lot of shoulder movements such as weightlifting, tennis, basketball, volleyball etc may increase the chances of injuring your shoulder. Fatigued muscles and tendons in the shoulder also increase injury. You wil notice you have been injured if you experience extreme pain, weakness or stiffness in your shoulder area. The best forms of treatment are discontinued exercise, rest and applying ice on the injured areas. If the pain persists or you feel like you have dislocated your shoulder, consult with your doctor. If you are nursing an injured shoulder, minimize arm movements that may cause additional stress. Always check with a medical professional before taking any medications. Focus on strengthening your shoulder muscles through weight training to prevent injury. Warm up adequately before lifting extremely heavy or playing recreational sports that involve lots of overhead shoulder movements. If you are unsure of how to do an exercise at the gym, ask a trainer to assist you. Always train the entire muscle group for your upper body to create equal muscle balance and minimize injury. Any sport that involves a lot of running, jumping or quick movements may increase the risk of spraining your ankle. Twisting your ankle will cause a lot of pain and may even tear a tendon or a ligament. Sprained ankles will heal with gentle circular movement to encourage blood circulation. It also helps to rest and not apply pressure on the sprained ankle. Applying ice will alleviate stress and swelling. Ankle sprains usually recover relatively quickly. Strengthening your leg muscles will also prevent sprains from occurring. If you feel like your injury is more than a sprain or the pain persists, consult your doctor. Make sure you are wearing proper sports shoes that fit comfortably and warm up before exercising. Check that these shoes match your foot type (for example, flat or arched feet). Avoid doing unnatural quick movements that may stress your ankles. Finally, listen to your body. If you feel like you are in pain or that you are fatigued, stop exercising and rest. Many common knee problems are categorized under runner’s knee. This may include pain, aches and torn ligaments or cartilage. 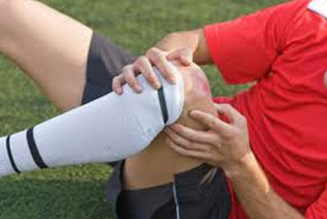 Injuries in the knee occur when the tendon underneath your kneecap is irritated or torn. This can be due to tired knees from over exercising, imbalanced or weak thigh muscles, extreme pressure on the knee or wearing worn-out sports shoes. Replace old shoes with proper shock absorbing ones. Stop exercising altogether or perform low impact physical activity that will not aggravate your knee. Apply ice on the injured knee and consult with a doctor to see if any anti-inflammatory medication is required. If the pain does not subside, book an appointment with your doctor to discover the root of the problem. If your injury is severe, you might need additional treatment or physiotherapy. The best way to prevent knee injuries is to avoid exercising on hard or uneven surfaces. Keep impact on the knee minimal and land softly when exercising with quick movements. Maintain a healthy weight and strengthen your thigh muscles with weight training to prevent injury. Always wear proper sports shoes and warm up before exercise. Gentle stretching after workouts also helps loosen any muscle tension. This injury occurs in the tendon of the elbow during sports that require backhand strokes. The tendon degenerates due to repeated movements which triggers immense pain in your elbow. This mostly affects tennis players and can even affect those who play golf. Treatment depends on the severity of the case and how long the tendon has been injured for. In minor cases, rest and applying ice on the stressed area is sufficient. However in extreme cases, physiotherapy, medication and a long break from exercise might be necessary. The best way to prevent this injury is to focus on strengthening your forearm muscles. Training with weights will prevent injury and increase your overall muscle balance. Make sure your backhand swings are perfected and stop exercising if you start to feel pain. Regardless of which muscle is strained, stressed, pulled or torn, there is a general guideline which you can follow to be on the road to recovery. The terminology stands for RICE and is practiced in first aid. Rest: simply rest your injured muscle and give it time to recuperate. Ice: apply ice on the stressed muscle to reduce swelling. Compression: wrap a compression bandage around the stressed muscle to apply gentle healing. Elevation: elevating an injured muscle will help to reduce swelling. Raise your injured muscle above your heart. For example, if you have injured ankles or knees, lie down on a bed and elevate your legs. Always make sure you warm up, stretch after exercise and stop exercising if you feel pain. Wear proper sports shoes and gradually increase your exercise intensity. If you experience prolonged pain, see a medical professional for expert advice.